"Asylum-seekers say they cross the border illegally because they don’t think they have other options" was first published by The Texas Tribune, a nonprofit, nonpartisan media organization that informs Texans — and engages with them — about public policy, politics, government and statewide issues. MCALLEN — After a cop took Claudia to a field, grabbed her by the throat and threatened to kill her and her 7-year-old son Kevin this spring, it didn’t take long for the 26-year-old single mother to decide it was time to get out of El Salvador. Kevin and his mother Claudia, hours after being reunited in South Texas in late July. Guatemalan migrant Roberto Bernabe, who crossed the river with his 3-year-old daughter and was released with an ankle monitor in early August, also said he didn't know he could request asylum at one of the bridges. “We arrived at the river and we know a friend there, and that’s how we crossed," he said. It's a more dangerous route for asylum-seekers, who sometimes walk for hours through the brushlands along the border, where heat-related incidents are the leading cause of death among migrants. "I know that crossing the bridge, doing things legally, is a point in my favor," he said. "And if I cross the river and the Americans catch me, that's a point in their favor because then I would be invading their territory." Disclosure: The University of Texas at Austin and The University of Texas-El Paso have been financial supporters of The Texas Tribune, a nonprofit, nonpartisan news organization that is funded in part by donations from members, foundations and corporate sponsors. Financial supporters play no role in the Tribune's journalism. Find a complete list of them here. Editor's note: The Texas Tribune and TIME have partnered to closely track the family separation crisis at the U.S.-Mexico border. This story is not available for republishing by a national news organization until August 17, 2018, at 6 a.m. Texas news organizations may run it at any time. For more information email nchoate@texastribune.org. Asylum-seekers say they cross the border illegally because they don’t think they have other options By David Yaffe-Bellany, Jay Root and Juan Luis García Hernández August 16, 2018 MCALLEN — After a cop took Claudia to a field, grabbed her by the throat and threatened to kill her and her 7-year-old son Kevin this spring, it didn’t take long for the 26-year-old single mother to decide it was time to get out of El Salvador. What happened next illustrates why so few Central American migrants enter the country the “right way” — at the international bridges, or ports of entry, where migrants can request asylum without crossing the border illegally. Claudia said she quickly called a friend who knew a smuggler. “She told me that’s what he did, that he was good — that he was responsible,’’ she said. The man told her he could do it for $5,000. But she would have to do it his way. “He said, ‘I do it but only with one method.’ They only will take you across the river in a raft, and on the other side you walk,” she recalled. “I asked him, ‘Why don’t you do it [at the bridge]?' and he said they don’t do it there because sometimes they get sent back.” Kevin and his mother Claudia, hours after being reunited in South Texas in late July. Every month, thousands of asylum-seeking families cross the Rio Grande and turn themselves in to Border Patrol rather than line up at a port of entry. Since October, more than 40,000 family members traveling together have presented themselves at the ports of entry without proper documentation; nearly twice that many have crossed into the country illegally over the same time period. (Neither U.S. Customs and Border Protection nor U.S. Citizenship and Immigration Services could say how many of the migrants who arrived at ports of entry requested asylum.) The Trump administration sought to curb illegal crossings by imposing a “zero tolerance” crackdown at the border this summer that left more than 2,500 children, including Claudia’s son, separated from their parents. “If you are seeking asylum for your family, there is no reason to break the law and illegally cross between ports of entry,” Homeland Security Secretary Kirstjen Nielsen declared on Twitter at the height of the family separation crisis in June. But that message ignored the deep-rooted factors — from smuggling practices to the complexities of U.S. immigration law — that drive Central American asylum-seekers to the river, despite the risks of a clandestine crossing. Asylum-seekers like Claudia start on the path to an illegal crossing long before they actually reach the banks of the Rio Grande, relying on guidance from an informal network of well-meaning friends and often-unscrupulous smugglers. For years, asylum-seekers have taken that path almost by default, making it unrealistic to expect them to abruptly change approach in response to shifting political currents in the United States, according to interviews with migrants, immigration experts and U.S. law enforcement. For all the Trump administration’s rhetoric, migrants almost never base their border-crossing strategy on policy pronouncements from Washington, said Stephanie Leutert, who runs the Mexico Security Initiative at the University of Texas at Austin. “In terms of how you do it and what’s the right way — they’re getting that information from their neighbors and from their friends,” Leutert said. “And two, it’s smugglers selling packages. It’s been successful for their friends, so they’re going to sign up for that same package.” The smugglers “operate everything on the south side” of the border, said Robert Rodriguez, a Border Patrol agent in McAllen. 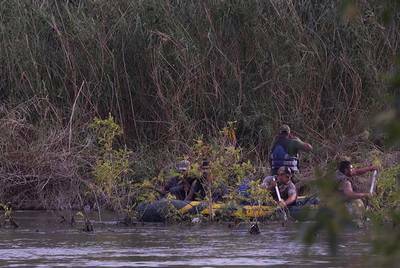 “If [migrants] start turning themselves in at the ports of entry,” he said, “they don’t make money.” A raft loaded with undocumented immigrants navigates the Mexican side of the Rio Grande across from Ruperto Escobar's ranch in April 2016. The ranch sits along the Rio Grande, the international boundary between the U.S. and Mexico, in Starr County in South Texas. For generations smugglers have used the ranch to move people and product across the border, and Escobar doesn't see that changing anytime soon. Todd Wiseman Many immigrants who pay smugglers to help them cross the Rio Grande do not know that the bridges are even an option for asylum-seekers. Over the past three weeks, The Texas Tribune interviewed more than a dozen Central American migrants who crossed the river and turned themselves in to Border Patrol. Only two said they had heard immigrants could request asylum at the bridges. Earlier this month, Honduran Javier Piñeda, sitting in the McAllen bus station with his 4-year-old daughter, Daisy Daniela, explained why he crossed the river instead of the bridge. He said his brother in North Carolina arranged and financed his journey from Honduras, including the illegal crossing. He just followed instructions. “Family members who had come before told me how it was, and so I took their advice and then I came,” Piñeda said. Asked whether anyone had mentioned a bridge, he said, “No, because I’m not familiar with it.” Guatemalan migrant Roberto Bernabe, who crossed the river with his 3-year-old daughter and was released with an ankle monitor in early August, also said he didn't know he could request asylum at one of the bridges. “We arrived at the river and we know a friend there, and that’s how we crossed," he said. It's a more dangerous route for asylum-seekers, who sometimes walk for hours through the brushlands along the border, where heat-related incidents are the leading cause of death among migrants. In late July, Yadira Veliz, 21, swam across the river with a group of asylum seekers and turned herself in to Border Patrol. She was eight months pregnant. “I was just asking God for help,” said Veliz, who was fleeing Honduras. “I just wanted to cross.” But while theoretically safer, crossing the bridge carries its own risks. Despite the government’s assurances, over the years there have been sporadic reports of U.S. officials separating migrant parents from their children at ports of entry. Other asylum-seekers say they have been turned away by armed Customs and Border Protection officials stationed on the bridges who claim the ports of entry are over capacity. “I think it’s visually so intimidating,” said Guadalupe Correa-Cabrera, a political scientist at George Mason University and the author of a book about organized crime in Mexico. “They don’t believe they can enter through there. However, they know they can do it with a smuggler.” Honduran José Aguilar, 35, crossed the international bridge between Brownsville and Matamoros with his two children in early August. But unlike most Central American immigrants, Aguilar had a visa allowing him to travel freely through Mexico, without help from a smuggler. In the Mexican city of San Fernando, Tamaulipas, about an hour and a half from the border, Aguilar got assistance from an evangelical group, which recommended that he bring his family to a port of entry. "I know that crossing the bridge, doing things legally, is a point in my favor," he said. "And if I cross the river and the Americans catch me, that's a point in their favor because then I would be invading their territory." 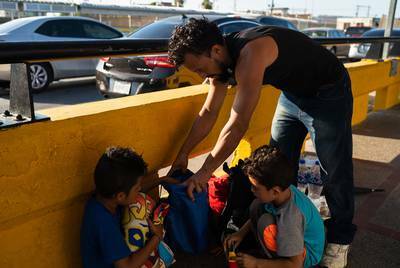 José, 35 and his sons Dariel, 10 and Ezequiel, 7, from Honduras, get ready to be processed after waiting to seek asylum on the Mexico side of the Gateway International Bridge in Brownsville, Texas, for three days. Verónica G. Cárdenas for The Texas Tribune Over the years, however, crossing the Rio Grande has had certain procedural advantages. Immigrants who enter the country illegally are generally eligible to be released on bond, while those who present themselves at the bridges stay in detention unless Immigration and Customs Enforcement officers decide to release them on “parole.” “It’s actually better for you in a number of ways to cross the river,” said Jeremy Slack, an immigration expert at the University of Texas-El Paso. “The likelihood you’ll be released on bond is greater. Instead of having to pursue your asylum claim entirely in detention centers, you can do so from the place that you’re intending to live.” Federal courts have taken notice of this legal quirk, which successive administrations in Washington have glossed over while urging migrants not to cross the border illegally. Immigrants who arrive at a port of entry are left in a sort of statutory limbo — deemed legally “inadmissible’’ — whereas those who cross the river without permission have due process rights that allow them to appear in front of a judge. “Ironically, this dichotomy conferred greater legal protection upon aliens who entered the U.S. illegally and secretly than those who attempted to seek refuge by presenting themselves unsuccessfully to the officials at ports of entry,” the Yale Law & Policy Review wrote in 2000, discussing a 1984 appellate court decision in an asylum case. “Because aliens who illegally crossed the border in the dead of night achieved a ‘deportable’ status while aliens detained when attempting to enter lawfully were deemed ‘excludables,’ the law rewarded those illegal and undocumented aliens who successfully avoided our laws by evading interception.” The rules for border crossers changed abruptly this spring, though, when the Trump administration implemented its controversial plan to criminally charge every migrant who crossed between the ports of entry, including asylum-seeking parents. At the end of June, Trump rolled back the policy after it provoked a bipartisan firestorm, setting the stage for hundreds of family reunifications over the last month and a half. (More than 500 families remain separated.) Claudia and Kevin were reunited on July 23 after about two months apart. Now, they’re settled in northern Virginia, as Claudia’s asylum case works its way through the immigration system. In her asylum paperwork, Claudia says she was threatened by a cop who was in cahoots with a gang member she had filed a complaint against. Despite the trauma of the past few months, Claudia said she doesn’t think crossing at a port of entry would have guaranteed a better outcome for her and Kevin. While she was in detention, she said, she met a Brazilian woman who crossed a bridge and was still separated from her child. And she pointed out that there are also risks to waiting on the Mexican side of the border, where smugglers control the flow of migrants and stories of kidnappings abound. “It’s a very big river and anything can happen,” she said. “But the same with the bridge ... in Mexico, there’s a little bit of everything.” Disclosure: The University of Texas at Austin and The University of Texas-El Paso have been financial supporters of The Texas Tribune, a nonprofit, nonpartisan news organization that is funded in part by donations from members, foundations and corporate sponsors. Financial supporters play no role in the Tribune's journalism. Find a complete list of them here. Editor's note: The Texas Tribune and TIME have partnered to closely track the family separation crisis at the U.S.-Mexico border. This story is not available for republishing by a national news organization until August 17, 2018, at 6 a.m. Texas news organizations may run it at any time. For more information email nchoate@texastribune.org. Read related Tribune coverage "It's humiliating": Released immigrants describe life with ankle monitors Immigration "loophole" that Trump bemoaned returns after zero tolerance rollback Hours after deadline, federal government lays out plan for reuniting kids with deported parents "Asylum-seekers say they cross the border illegally because they don’t think they have other options" was first published at by The Texas Tribune, a nonprofit, nonpartisan media organization that informs Texans — and engages with them — about public policy, politics, government and statewide issues. Link back to the original article, which is located at https://www.texastribune.org/2018/08/16/migrants-who-cross-border-illegally-say-theyre-unaware-alternatives/.